ArcMap® style files (.style extension) can be used to standardize map symbolization. This report describes the methods used to create several styles for lithology or geologic time. The styles are color fills which were created by assigning RGB color values to attributes of polygon shapefiles. The terms symbolized were either generated from terminology hierarchies from various sources or digitized from scanned images of existing legends. 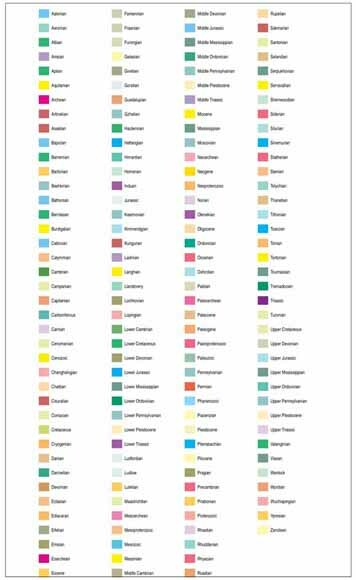 For large lithology lists, a table format was used as a convenient method for experimenting with shades of color as well as for documenting the RGB color values. Examples of styles were adapted or created from the following legends: the International Stratigraphic Chart (ISC) and the USGS Color Code version of the ISC; the Decade of North American Geology (DNAG-1983 Geologic Time Scale); the North American Geologic Map Data Model version 4.3 (specifically lithclass 4.3 and its successors lithclass 6.1 and lithclass 6.2); and the State Geologic Map Compilation (SGMC). The digital package consists of ArcMap® styles, and Microsoft® Excel color documentation tables. The software used includes Environmental Systems Research Institute (ESRI®) ArcGIS® version 9 (ArcMap® module) and Microsoft® Excel 2003. Other software tools used in preparing the files were Pixie color-picker, and the Science Language Interface Module.